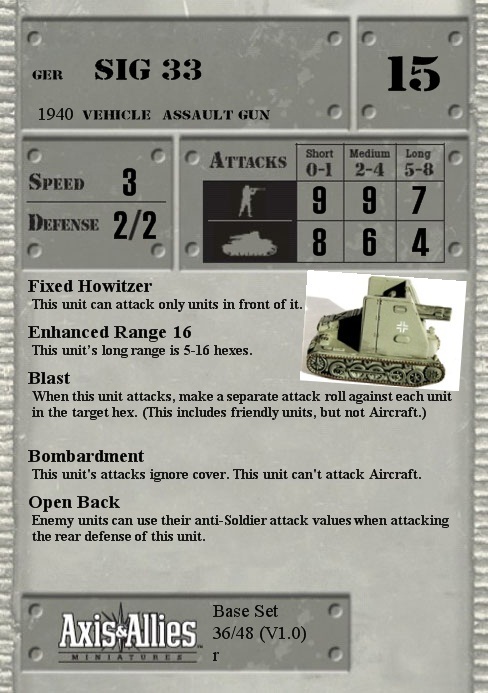 The Invasion of Poland had shown that the sIG 33s assigned to the infantry gun companies of the motorized infantry regiments had difficulties keeping up with the tanks during combat. The easiest solution was to use a spare tank chassis to carry it into battle. It was first mounted on a Panzer I chassis and given a lightly armored superstructure. This produced an adequate vehicle, but the center of gravity was very high, and the chassis was overloaded. As a result only a few dozen were built. Since the over-loaded Panzer I chassis was too small for the gun, production switched to models using the chassis of larger, more suitable tanks. Compared to what it was before WotC made the new cards, this unit is completely different. It is actually now quite playable. Very good at taking AT guns & infantry in cover at a very long range. Like Aran55633 said, leave it behind as it has a very weak armour. Make sure you have air cover to protect it as even a fighter plane can be a trouble for this assault gun. Very solid sculpt. Well sculpted. I like it.